This grill defined a new breed of pirates. In the 17th century, the island of Hispaniola (now Haiti and the Dominican Republic) was overrun by feral pigs, boars, and cattle. Hunters, drawn to the bounty of game, flocked to the island to make a tidy profit. Spanish ships were often docked in the ports, and the long-lasting, salted meat was an easy sell to sailors. But they first needed to cook it on a wooden, grill-like frame known as a boucan. Though many cultures have different takes on the grill, the name and practice of boucanning meat originates with the Tupi of Brazil. European explorers and conquistadors, impressed by the Tupi’s methods, brought both the technique and terminology to the West Indies. But it was French hunters who really embraced the boucan. Smoking huts and grills were such common sights at their camps that they became known as boucaniers. Pork was by far the most popular meat cooked on the boucan, but turtle barbecued in its shell (boucan de tortue) was also a favorite. To lend the smoke a strong aroma, boucaniers sometimes added the animal’s skin and bones to the fire. There were even distinct marinating techniques. The Sea Rover’s Practice: Pirate Tactics and Techniques, 1630-1730 notes that many grill-masters first brushed the meat with a mixture of lime juice, salt, pepper, and crushed pimento. Unfortunately, any subtle spices would likely be lost on those who took the meat to sea. Boucanned meat grew so dry after six months that sailors needed to soak the pieces in warm water before eating them. Eventually, the local Spanish government grew tired of the growing population of hunters and launched a violent campaign to drive them out. The operation was partially successful in making many boucaniers change careers, but backfired in one significant way. While some boucaniers turned to farming, others took to the seas and raided Spanish ships. As a result, the term boucanier became synonymous with the pirates who attacked ships. This became buccaneer. As the boucaniers dispersed throughout the Caribbean, they brought their cooking techniques with them to islands such as Martinique, Jamaica, and Trinidad and Tobago. 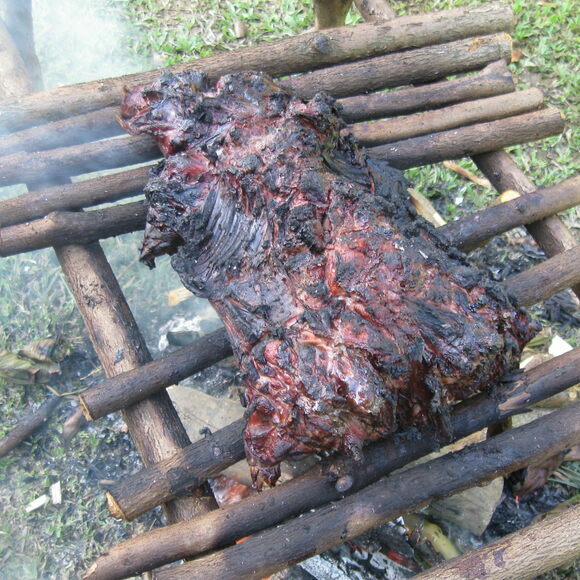 In Jamaica, the boucaniers influenced the local tradition of jerking, as members of the Maroon community started cooking their meat on a boucan. Though an authentic boucan is a rare sight nowadays, modern barbecue techniques owe a debt to the smoking methods of the hunters turned pirates. We may also have the boucaniers to thank for the modern pig roast. They threw raucous beach parties known as boucan de cochon. The only requirements: a shorefront, a roasting pig, and lots of rum. While boucanning isn't widely practiced anymore, you can still watch demonstrations of its relative, jerking, in Jamaica. The island's Boston Beach often features several cooks smoking meat over boucan frames. Pair a Brazilian confection with a sweet South African liqueur, and a unique treat is born. There's nothing tragic about this Brazilian pairing of salty, white cheese and guava paste. The animal's nose and upper lip make a savory, umami-rich soup.